Jigging for Walleye is one of the more popular angling methods used in Ontario. Jig head size, color selection, and bait are all important factors when targeting this species. Pink, white or chartreuse jig heads tipped with a minnow, leech or similar color twister tail are solid combinations throughout the season. Spring brings the Walleye to shallow water to feed. Cast your 1/8 oz. jig head out 15 or 20 feet, let it sink to the bottom and slowly retrieve. You may want to alter your retrieve with a slight twitch to entice a strike. As the water warms in summer and the sun sits high, the Walleye head to deeper water and sit on drop offs and points waiting to ambush their prey. The same casting technique works although you may want to go to a ¼ oz. jig. Depending on wind direction and speed, drifting through the depths is also very productive. Don't forget to work the weeds and pencil reeds in tea-colored shallow lakes like Five Mile. Jigging success continues well into fall where the Walleye feed at intermediate depths. Single hook worm harnesses such as Go-Getters in bright colors tipped with a worm or leech have continued to produce Walleye. Place a splitshot 12-16 inches up your line and slowly troll along weed beds, pencil reeds, shoals and rocky points. 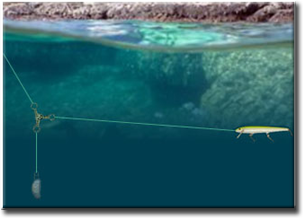 Use a heavier sinker or the 3-way swivel method in the diagram to the left in summer when fishing deeper water. Drifting with this technique is also very productive. Another good way to catch Walleye is to troll along the shoreline or rocky shoals just before dark or at day-break with a Rapala or Thunder Stick. A 3 or 4 inch Original Floating Rapala or a Junior Thunder Stick in black, gold, silver, clown or perch works well. Rapalas and Thunder Sticks are also good in the summer. You can fish for those suspended deep water Walleyes or troll shallow along weed beds and drop-offs. If you prefer casting, work the shallows, but don't forget the drop-offs.